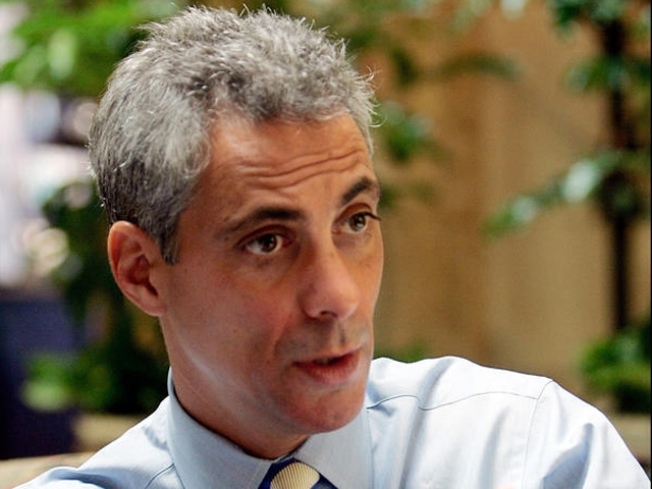 Rahm Emanuel is an alumnus of the Clinton White House and will be President-elect Barack Obama's chief of staff. Most of the still-living former White House chiefs of staff had already offered their two cents to Rahm Emanuel at a breakfast earlier this month when it came time for perhaps the most serious man in a room of serious men to speak. With that, said a source in the room, the 11 other chiefs of staff and the one next in line for the job let out loud laughs. In a job as often thankless at it is prestigious, it helps to have a sense of humor, and that was what, among other things, Emanuel was told in a rare, perhaps unprecedented, private sit-down with some of the most prominent political hands in recent American history. As Chief of Staff, McLarty ousted Emanuel from his position as White House political director as part of an early staff shake-up. (Emanuel, however, remained in the White House and worked his way back into good favor). There were other reasons for potential discomfort in the room. Card, for example, twice urged Bush to fire Rumsfeld from his post as defense secretary before leaving his White House post in 2005. But for all their personal and partisan differences, the group also happen to be card-carrying members of the political establishment and figures who, when called upon, are happy to return to the ultimate seat of power and share their accumulated wisdom. One-by-one, at Bolten’s direction, each in the group took his turn at the table, offering advice, giving suggestions and generally trying to prepare the hard-charging Emanuel for a post that is stress-inducing even in more tranquil times than now. “It’s like running a continuous sprint every day,” recalled Skinner, who was Bush 41’s second chief of staff. Most of the suggestions were serious – after offering his quip, Cheney shared his real insights – and ranged from the personal to the professional. He might have been a former top aide himself in the Clinton administration, but Emanuel took “copious notes” the whole time, one participant recalled. "There was a lot of camaraderie,” recalled Emanuel. “This is a shared experience of just about a dozen people, and it was touching that Josh pulled it together and that so many could attend and wish me luck." Despite their political differences, Emanuel and Bolten have developed a congenial personal relationship working on opposite ends of Pennsylvania Avenue since Bolten took his position in 2005. For many in the room, it was not only an opportunity to initiate Emanuel into the club but to reaffirm the natural bond that exists among the select group. Yet aside from the brotherhood-of-javelin-catchers-kinship there was also a sense from those present that Americans are fed up with partisanship and want their political leaders to come together to take such steps at a moment of potential crisis. But for all the sober counsel dispensed, this wasn’t only a group of wise men – it was also a group of men. So there was no lack of jocularity in the bunch. Bolten, who is Jewish and a motorcycle aficionado, set the tone by hosting the get-together in an office that is currently dominated by a Christmas tree bedecked with Harley-Davidson ornaments and pipes instead of a star on top. Memories were shared, stories swapped and the outgoing Bolten honored for his recent service. And the Chicagoans in the bunch, four in all, made much out of their shared Windy City roots. Rumsfeld, especially, got a kick out of his sharing a high school alma mater -- the North Shore’s well-known New Trier – with Emanuel. The group also posed for a photograph in the Roosevelt Room and met briefly with President Bush in the Oval Office, in a session that was part of what officials in both parties are describing as one of the most orderly transitions in recent history on the part of both the outgoing and incoming administrations.